Steven Powers (SMP): WIP "Alien In a Hostile Land"
WIP "Alien In a Hostile Land"
"Alien in a Hostile Land"
At least that is the working title so I can easily find it at a later date. This WIP (Work In Progress) is a personal project that didn't really start with a brief. I normally try to make a point to create a brief for all projects in a simple text format . Then I add progress notes of what to work on next. This way I have a to do list of items to proceed with when I work on it again. Instead of using Bridge with Photoshop to track or browse files, I use IrfanView Thumbnail Viewer (that installs with IrfanView) because it is a very light weight app. It will allow me to also open the files in any external editor. In this case, the parts just started to come together. It started with me doodling in Photoshop with a simple soft brush, opacity controlled by pressure, working on a value sketch (gray scale only) to see what I could find within the scribble. The technique is similar to looking at a cloud and finding a shape within it. 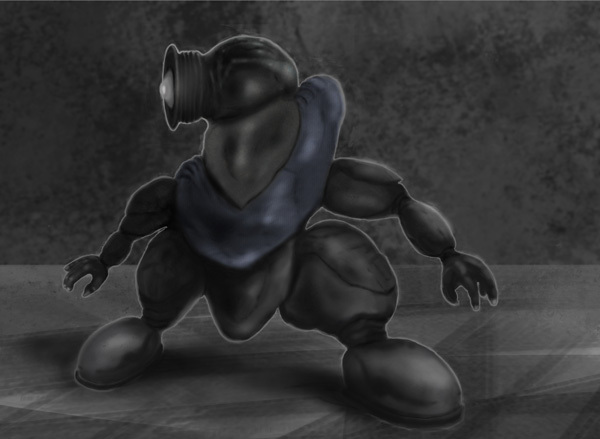 In a short time I had created a little alien in perspective. 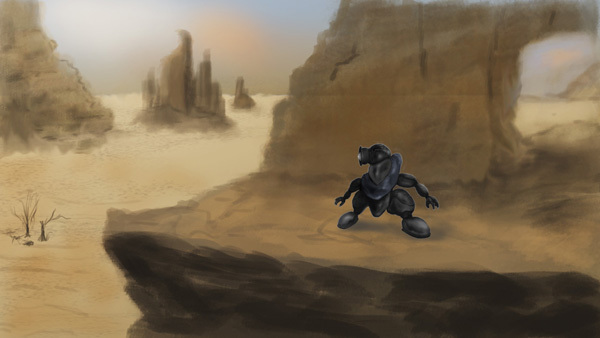 I cleaned up the silhouette a bit, added texture, rim lighting and a very simple "throw-away" background shown below. I then had to think about what type environment the character would work in. This is where it is good time to start thinking about the story behind the character. Where is he from, what is his purpose, is he wearing a suit and why, why and what does he look like underneath, what kind of world does he come from, etc. This will help in determining other aspects of the scene that will be our final image. So I blocked in the "Desert Environment", creating distance with values but not much detail. Here again I asked question about why he would be there. It looks somewhat inhospitable ...not sure why anyone would be there especially travel space to get there. This again adds to the story and that is the most important thing about art..Whether you are doing full blow movie productions, animated shorts, still images or novels to short stories. The Story is what makes it all come together. At this point I imported our alien and placed him in the foreground. This helps establish the scene with size and proportion in regards to the character and environment. Keep in mind that in regards to values, the darker and more saturated colors will be in the foreground and diminish as we travel to the background. In a scene like this, there are add issues with the background having blueish haze due to moisture content in the air ...even in dry climates as this. Note when working within Photoshop one is able to import an image as a "Smart Object" which will keep the files size of the scene down. All edits to that smart object, in this case our character, will be done in it's own file. Color correction and other adjustments will still be accomplished in the main image. So now with the alien in the foreground looking over his shoulder, the question arises, "what is he looking at?" 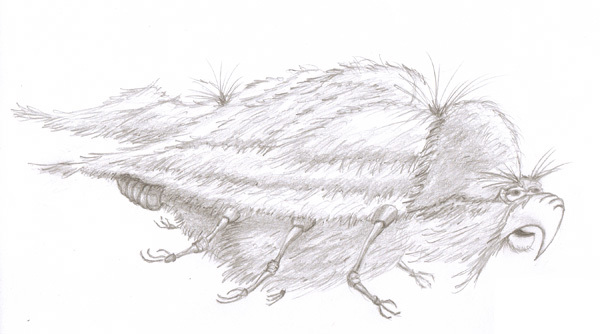 That is where the "Hairy Flying Beast" comes in. 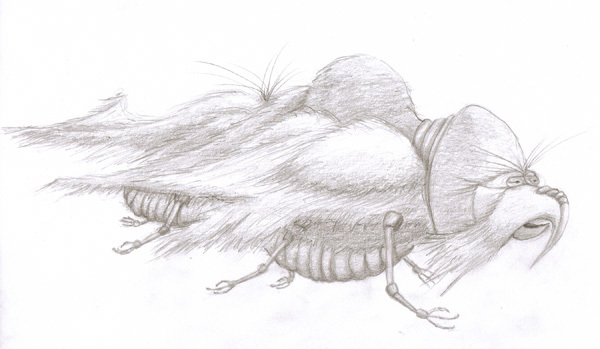 Prior to this project I had come up with a hairy flying beast. My approach was the same as with the alien except I did it in pencil. 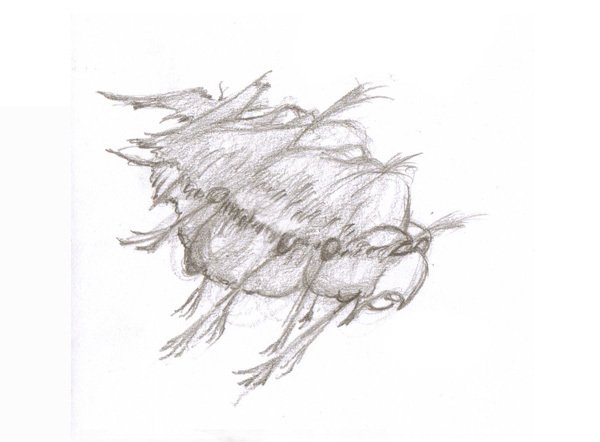 This original was just a thumbnail approximately 2"x2", but then I did a few other iterations at a higher resolution, but in the end I still like the original design and shape. Of course this design will have to be expanded into a perspective drawing to fit this scene, but this is why it is always a good idea to work at low resolution, in thumbnails and block in quick ideas before committing to a composition. Only after you have decided on the details should you start adding the finer details such as composition, lighting and direction, focal point, style, etc . No one likes finding themselves half-way through a project or more, to be faced with a flaw that needs to be fixed. In some cases it has been easier to start over. Working like that will get you nowhere fast. One must be quick, efficient, and flexible. Clients will always through a wrench into the works, which is to be expected ...they are paying for it. The last thing that I started playing with was adding detail and reason to the environment. I see a the foreground where the alien is standing to be the opening of the ruins of a long forgotten castle. That will give interest to his surroundings and add depth to the story line. The mid-ground rock formation could be substituted for another city. 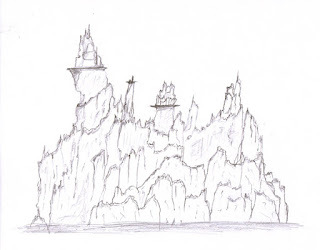 Whether it is inhabited of more ruins would be determined by adding movement of ships or lights or anything that would indicate life. Maybe I have been watching too many episodes of Stargate SG-1, which you shouldn't discount what you have been doing in your daily life. It will work it's way into your art. That is a good thing as long as you understand that. That is how I create a"virtual library" in my head of various topics. I regularly will do preparatory sketches of specific elements like a certain flower, or eyes, hands, etc if that is going to be in my final painting to warm me up and to build a mental library in my head to pull from. The minimizes using photo reference when trying to create and original painting. It isn't too original if you must keep referring to an image. So in this painting, before I start adding details to the various elements. 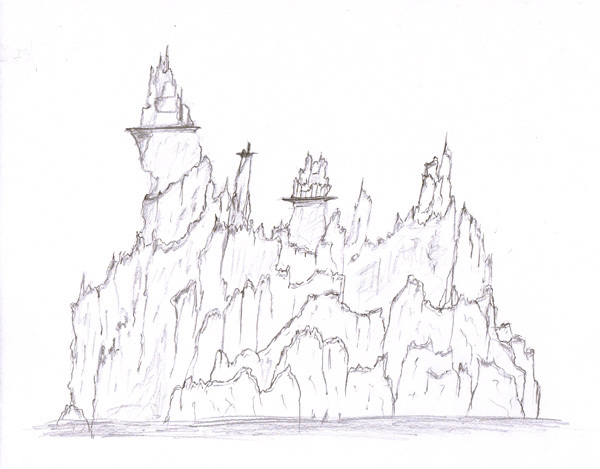 I will spend time in doing sketches of rock castles, rock formations and maybe some camels. 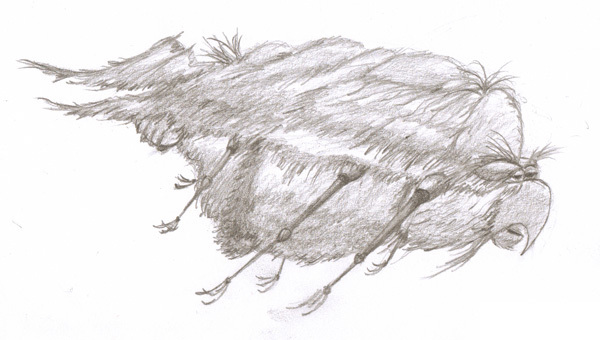 The flying creature, when in the desert setting, makes me think of a camel. Both have humps and hair and are now in the same environment. So drawing a few sketches from photo reference of camels would be a good start. Then a study on large birds and how they move in the sky to add a little realism. "Side Benefits and Multiple Pieces of Art"
One might look at this as a lot of work for only one image or painting. 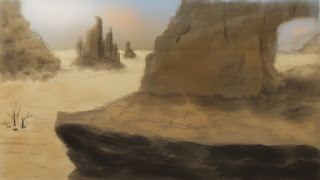 But as with a large matte painting where there is a much bigger story going on and depending on the resolution, I could get at least 3-4 paintings out of my effort for this one. We will have two characters, an environment and a city in the mid-ground let alone the foreground ruins. Of course the composition will have to be compensated for each element in regards to lighting, color, cropping, etc, all of which can be accomplished quickly afterward. The major work has been completed at this stage. It is far faster to crop out elements that you don't need compared to creating those that you do need. This is also a benefit to working in a digital environment such as Photoshop. We can keep elements separated by layers and groups allowing for detailed corrections at a later date. Also if you created the characters in their separate .psd files and import them into the matte painting as smart objects, then you will have even more control in editing them. The level of detail can range form a painterly-effect (not sure if that is a real word, but it is used) to photo-realism, as always dependent on desire, skill and time. So I hope you can learn something from this. This isn't a workflow or method I have come up with. Many artist do this and I have been lucky enough to have them share their experience and insights with me, so I am just passing it along. When I do finish this project I will post it here and make it available for "Prints On Demand" through Fine Arts America.